The Olympic Games (exhale). Well, not quite yet. Those officially start Friday, but don’t tell Whistler. Based on their scurried preparation all day, I’d say they know how much time they have down to the second. For me, my trip to the 2010 Games started with a fourteen-hour drive and a late-night pitcher of dark beer (not at the same time). As I sit here at my computer, now twenty-four hours in, I’m thinking about the two faces of Whistler that I witnessed today– starting completely different than it finished. To put it simply, it is pre-morning versus post-morning coffee. I could feel the transformation happening right before my eyes: from the mega posters now hanging from the slope-side condos, to the splattering of temporary media structures erected all over the city. The energy of the people, the infinite amount of volunteers donning their questionably sky-blue outfits, and the village where a tangible excitement was ratcheting up throughout out the day. The preparations hit overdrive. In fact, I even overheard a practice medals ceremony, where the winter sport powerhouse countries of India, Egypt, and Kenya took home the medals. It made me chuckle a bit. With my local guide, Louis — a friend I taught with in South Korea — showing me around, I put forth an outstanding “prep session” myself. I mean, if the Olympics can do it, can’t I? 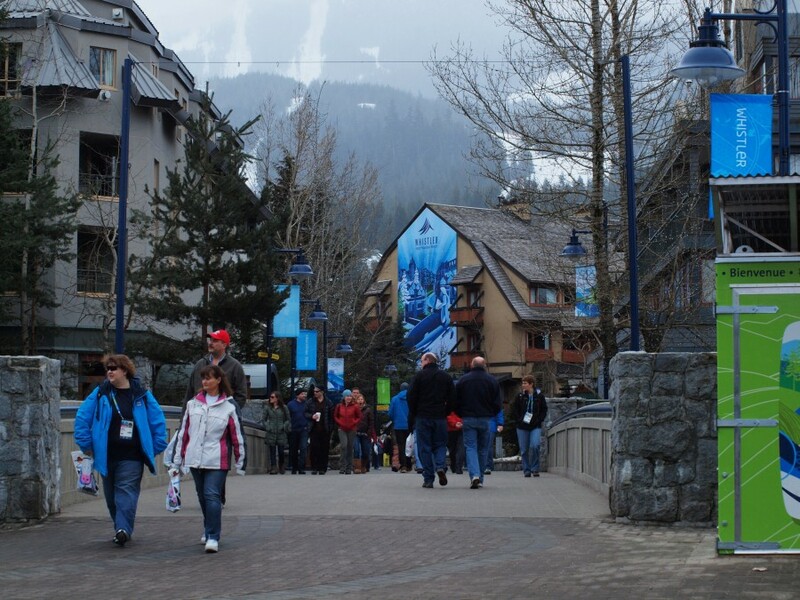 My first reaction to Whistler is how personal the village feels. It is modeled after an old European ski town, car free but for two streets, and architecture to match. It wasn’t Aspen yuppy, which often comes with the development of a resort. It felt welcoming and intimate — just how a ski town should feel with two imposing peaks always looming over your shoulder. Then, I couldn’t resist the burly, bearded mountain man in me any longer. 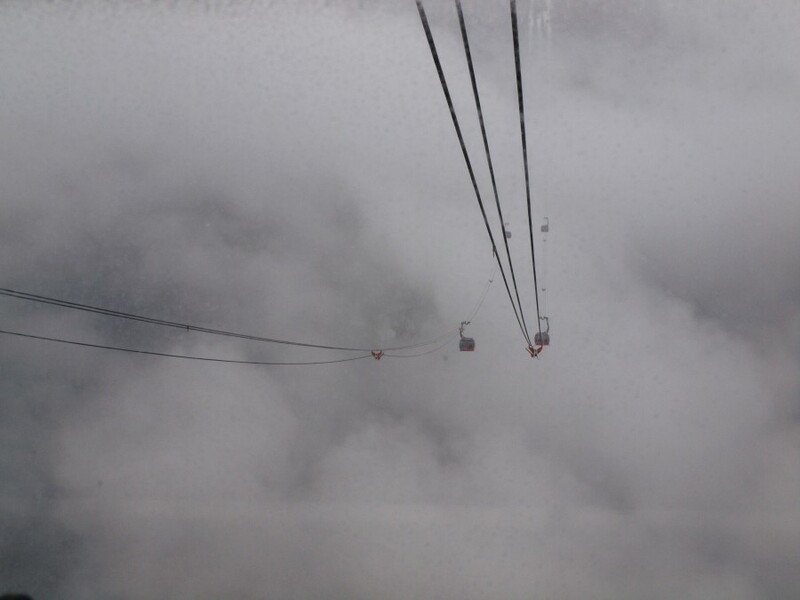 We jumped aboard a lift that took us up to the one-of-a-kind, world-record-shattering, Peak-to-Peak Gondola. This feat of engineering is truly remarkable. For 11 minutes, I dangled 1,472 feet in the air in a metal box climbing 7 1/2 meters per second, hanging from three strings nearly two miles (1.88 to be exact) from their nearest support pole. It was unnerving, amazing, and unbelievable. I would add breathtaking, but we traveled through a cloud most of the trip making the vistas look more like a milky white soup. It’s been a good start to the trip. The Mounties took it easy on me at the border, I got a great tutor of the Whistler area and the mountains, and should be set up now for a wicked time for the remainder of Olympics 2010. Tomorrow, I’m off to begin my own version of 36 hours in Vancouver. But, with so many highlights around the city and extra sights to visit because of the Games, 36 might not cut it. Besides, I heard a rumor there may be some kind of fire stick traveling through town, with ensuing celebrations . . . just a rumor, though.